This is meant to be a fun opportunity. There isn’t a competitive element. There isn’t a scoring element. 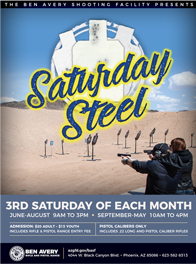 This is just an opportunity to shoot some steel targets in an interesting presentation. “Hot” loads that could penetrate or deform the steel targets, as well as steel core ammunition of any caliber, are not allowed. As a reminder, all firearms must be cased or properly holstered before entering the range. Hearing and eye protection also is required. Targets will come in various sizes and shapes, including silhouettes, circles, squares and rectangles, each presenting a unique challenge.